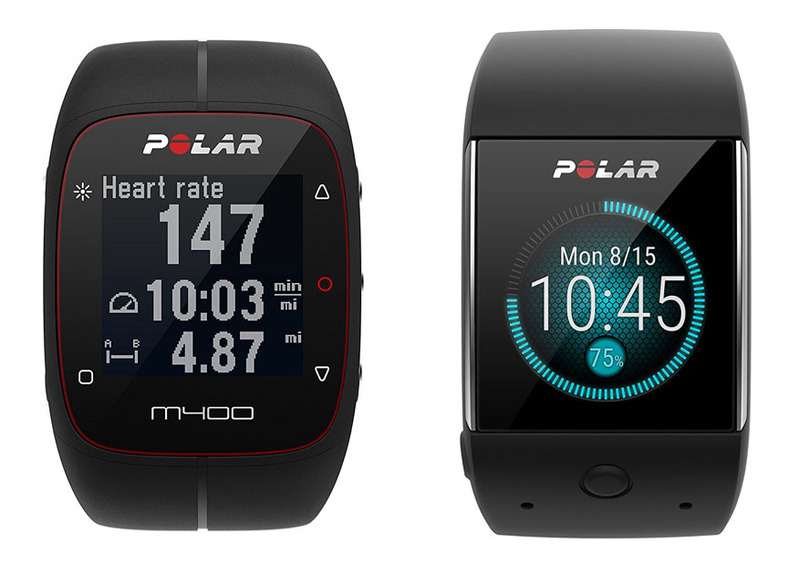 In the following article, we will see the comparisons of Polar M400 vs M600. They are sports/fitness smart watches with great features and capabilities. However, Polar M400 is available at a more affordable price, compared to Polar M600. Before you make your decision, continue reading below to see which model that gives the best value for the money. The first difference that you can notice right away is the display. Polar M400 comes with a monochrome display that has a resolution of 128 x 128 pixels. The display is pretty sharp, and the brightness is good enough to be easily readable outside. However, compared to Polar M600, it doesn’t look as attractive. Note that Polar M400 is operated by buttons. See also: Polar A300 vs M400. Polar M600 boasts a color touch display with Gorilla Glass 3. The display looks a lot more pleasant and interesting. The colors are nice, and the resolution is higher at 240 x 240 pixels. The brightness is good. You can read the displayed information even under the sun. The touchscreen control is intuitive and responsive. Polar M400 is actually quite durable. The construction feels solid. However, it is only water resistant and not fully waterproof. In other words, it cannot be submerged under water for an extended time. Nevertheless, it can withstand sweat drops and water splashes. Polar M600 has better overall build quality. The display is protected by Gorilla Glass 3, so it is very durable. The display is virtually resistant against scratches and impacts. Also, the whole unit is waterproof with the IPX8 rating. It can withstand submersion to 10 meters under water, so it is suitable for swimming. If you only need basic functions such as steps, distance, and calories tracking, Polar M400 is already an excellent choice. It also has sleep tracking, inactivity alerts, goal targets, recovery status, and smart notifications. However, it doesn’t have full smartphone integration or Wi-Fi. Polar M600 runs on the Android Wear operating system. As the effect, it is compatible with a wider range of apps and services. You can install more apps on the device. It also supports voice commands via Google Now, which is very convenient. The smartphone integration is better, featuring smart notifications and music control. According to Polar, M600 is compatible with Android and iOS. This model has Wi-Fi. Note that Polar M600 has been criticized for having poor heart rate monitoring. The internal heart rate sensor may drop from time to time. However, the heart rate monitoring works well with an external sensor. Last but not least, Polar M400 only has a 190 mAh battery. This device can last for about 8 hours per charge with the GPS and Bluetooth turned on. So, this device will need to be recharged daily or every after use. Meanwhile, Polar M600 comes with a 500 mAh battery which can last for about two days per charge; however, it may become significantly shorter if the Wi-Fi and GPS are continuously turned on. - Please refer to the iOS/Android Comparison Chart for full features.Please review user manual attached below for item troubleshooting. Between these two models, Polar M600 is more recommended. It comes with a much better color display. The build quality is better, with Gorilla Glass 3 and IPX8 construction. There are great features, including music control, and the battery life is also better.